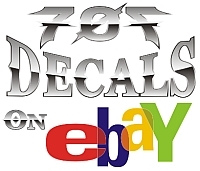 Bulk Wholesale Decals, Stickers, as Low as $.30, Free Shipping! Bulk Wholesale Discount Rates and Free Shipping!! We are Back! New designs available soon! If you dont see the designs you are looking for, please feel free to contact us. We can now do custom high resolution full color printed vinyl decals!